If you have a customer database that you’ve not talked to in a while then get in touch to see how we can help you create interesting communications that’ll stir them into remembering you, contacting you and hopefully buying from you! 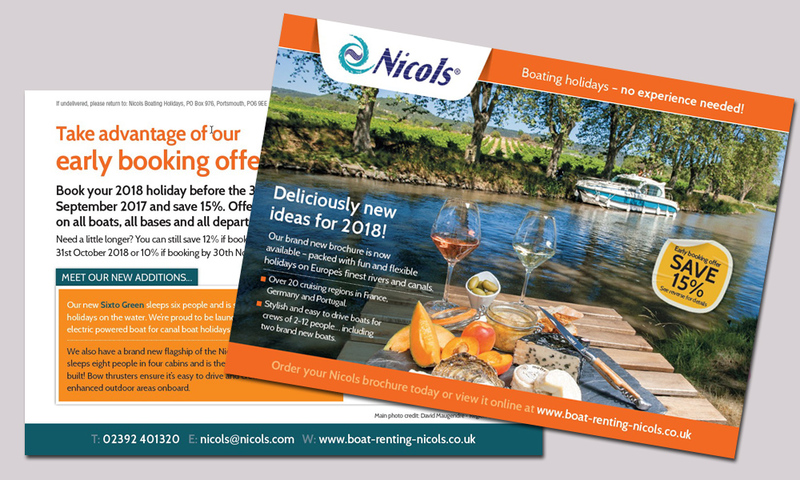 A recent example is a project we’ve completed for boating holiday specialists Nicols which was to produce a direct mailing postcard introducing the launch of their brand new 2018 brochure. Our idea was to minimise the waste and cost of sending brochures to the full database and instead send a more cost efficient teaser with a call to action for those desperate to receive a copy! We wrote it and designed it, then got it printed on a lovely card stock to reflect the high-end nature of the holidays on offer. We then cleaned the Nicols database and over-printed name and address details in an area specifically set aside on the postcard – which would also contain the pre-paid postage artwork. Basically we made it nice and easy for Nicols! The tracking of any subsequent requests and the inclusion of an early booking offer meant that we had something tangible to monitor the success of the mailing. Savings made as a result of this activity mean that there are plans to run a series of these postcard mailings throughout the year. Meanwhile, if you’d be interested in finding out more about boating holidays in France, Germany and Portugal then we’d recommend ordering your very own copy of the Nicols brochure. You can order a hard copy online or view a page flip version. Nicols are just one of a few travel and leisure clients that Mondo work with. In addition to direct mailing we handle their PR, write engaging SEO friendly content for their blog and email newsletters, design and book their print advertising and manage their Google Adwords campaigns.